"Oildale, CA: Home of Good Schools, Good Homes and Good Citizens." That's the slogan that Linda and Fred Enyeart use to promote their love for Oildale. The flyer, conceived, designed and posted by the Enyearts, conveys admirable aspirations and some core truths about Oildale. 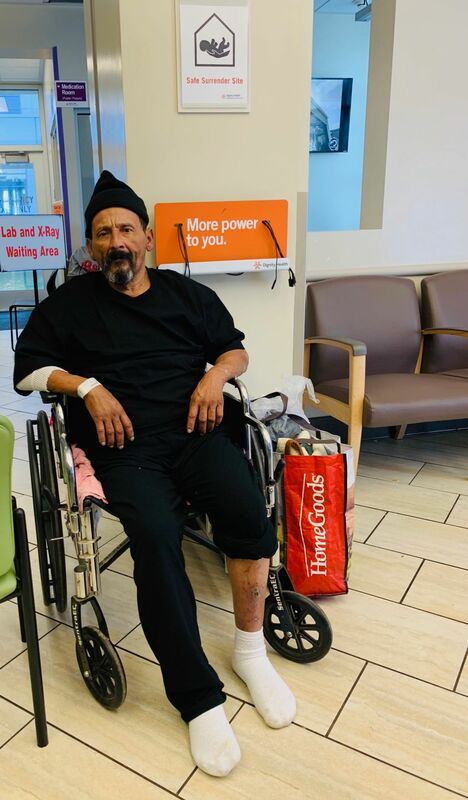 Ignacio Tapia, the homeless veteran discovered Dec. 23 in an east Bakersfield alley, is now getting some of the care he needs. The Californian’s Robert Price answers your questions and takes your complaints about our news coverage in this weekly feedback forum. Questions may be edited for space and clarity. To offer your input by phone, call 661-395-7649 and leave your comments in a voicemail message or email us at soundoff@bakersfield.com. Include your name and phone number; they won’t be published. Reader: What a big surprise and Christmas gift it was for us to see the front page of the Dec. 23 Californian and your Sunday column ("Where We Live: The fight to save Oildale"). For those of us old enough to remember, the TV show from the early ’80s comes to mind: "You take the good, you take the bad, you take them both, and there you have ... 'The Facts of Oildale.'" You know, sometimes it's hard to hear the truth, but now maybe your readers will know that Oildale is not all bad. We know what we see when we are driving through town, but you went out and interviewed people on the streets. There are many good citizens here who care and are doing something to improve our community. A few more that deserve honorable mention are Jennifer David, Ernie Gonzalez and Kevin Freeman: They all work very hard in the worst areas to uplift the ones that need it the most. It is very nice to get recognized. We will continue to clean up, paint over and beautify to make Oildale just a little better. We will be using our slogan to get people to understand that you can make a difference: "Oildale, CA: Home of Good Schools, Good Homes and Good Citizens." Thank you. Price: I know a few people were wary to learn I was taking a deep-dive look at "Bakersfield's Tenderloin District," as someone characterized it for me. Bakersfield's northern appendage, ZIP code 93308, is saddled (and addled) with transgenerational poverty, drugs and homelessness. I expected a certain amount of blowback for just having discussed it. None was forthcoming. I appreciate the positive response and I salute (once again) the people like Donna Clopton, Dave Kadel, the Rev. Ben Hanna, Supervisor Mike Maggard, you and your husband Fred, and the others you mention who are working so hard in the face of such adversity. Bravo. Reader: I just had a chance to read your article on Oildale. You nailed it perfectly. I grew up there and it was a great community to grow up in (except for the racism). I moved to another community due to the rampant drug use and crime. I would love to see it return to its former self. As far as jobs, there are jobs out there for people who want to work, but many cannot pass a drug test. Many are content just living off the government. So sad. Anyway, keep up the good work. I can’t wait to read your other articles on other parts of Bakersfield. Reader: You knocked one out of the park on Dec. 23, Robert. I can't wait for your next installment. This is going to be a series, right? I've lived here since 1960. Can I make suggestions? I hope you will profile some outlying areas like Arvin, Lamont, Wasco, Tehachapi, Glennville and Lake Isabella. Places like that. You would have my eternal readership. Do they give out Pulitzer Prizes for local journalism? If they do, this first entry in your series is a great start. Price: Where We Live is indeed envisioned as a series. Oildale, with all its drama and underappreciated protagonists, will be a tough act to follow. For the time being, I'm going to focus on communities and neighborhoods within metro Bakersfield. (Suggestions, anyone?) At some point I may stray further along the highway, though. Those towns you mention all have stories to tell. Pulitzer? Unless you're on the selection committee, John, I won't get my hopes up. Reader: Hey, Robert, perhaps you could write a column on this poor illegal immigrant up in the Modesto area that killed this police officer. You seem so willing to take care of the downtrodden. I'm sure you can find a reason that he did what he did. Liberalism is pathetic. Price: I guess I wrote about the downtrodden in my aforementioned Where We Live opus on Oildale. Plenty of downtrodden folks live there — as well as ordinary residents, conservative and liberal alike, working to help them. I might have written about the downtrodden, but your neighbors in Oildale actually care about them enough to roll up their sleeves and do the work. The same applies to the people who helped Ignacio Tapia, the homeless, non-ambulatory veteran who was stuck in an east Bakersfield alleyway. That's not just Christmas spirit; that demonstrates a year-round giving nature. Your "suggestion" is quite a leap, Harold. I share your anger and frustration, but a lot of factors are in play here, and a failed immigration system is just one. Reader: Your article on the homeless man was touching, but some things need to be addressed ("Homeless vet plucked from cold alleyway is getting help he needs," Dec. 27). It's a tragic case, but his being a "homeless veteran" does not add to its seriousness. As one who answered the call, served two years in the Army, one of which was as an infantryman in ’Nam, it's simply wrong to insinuate that someone who served 25 years in the National Guard (a part-time duty) and retired as an E-6 is somehow "special." So what's this guy's real story? Is his disability related to military service? Or, perhaps his own lifestyle and choices have created his situation, dire as it is. I can assure all readers that the military has always carried its share of bad apples on its rolls — reflective of society in general! Price: That story wasn't about Tapia so much as it was about Audrey Chavez and the many kind people who stepped up so quickly and enthusiastically to help him. Tapia told me he can't walk because of a diabetic ulcer; whether that's related to a lifestyle choice, military service or something else, I can't say. You're right: U.S. veterans are a reflection of society overall — we get the good with the bad. The story did not insinuate that Tapia was in any way special, but I think it made clear that people like Chavez most definitely are. Reader: As a former deputy DA in the Kern County DA's office, I have to say that Jason Kotowki's story on Lisa Green ("District Attorney Lisa Green reflects on her time as top prosecutor and notable trials as retirement looms," Dec. 23) is so well-written and competently highlighted those qualities which have made her such an outstanding lawyer. Lisa seeks the truth, fighting evil to attain justice. And that is a prosecutor's goal — not just winning, but winning for the right reason because the defendant is guilty and you can prove it. — H. Dennis Beaver, Esq. Price: I agree: Jason did a nice job with his well-deserved tribute to the outgoing district attorney. Reader: While your coverage of Christmas service at St. Francis was lovely, I am disappointed that you hardly ever feature other Catholic churches in town. Christ the King in Oildale is a beautiful little church that also has a Christmas Eve service with the children. St. Philip and St. Elizabeth Ann Seton also have beautiful services that are newspaper-worthy. Please consider highlighting one of these churches in the future. All of these churches go to a lot of rehearsing and practice to put on a beautiful ceremony and they also deserve some recognition. Price: You're 100 percent correct. We often default to St. Francis because it's closest to the city's center and often plays an outsized role in civic affairs, but metro Bakersfield has many houses of worship and you have named three that are quite worthy. A flyer is taped to the front glass doors of Wattenbarger hardware, the Oildale lumber store and neighborhood institution founded in 1946.